January 26th in WP Stuff by Wordpress Jedi . Many of us earn a living from ads and affiliate links. Relying on AdSense and other similar networks is not the only way to make money though. If your site gets a lot of traffic, you could always manage and sell your advertising space to get better deals. 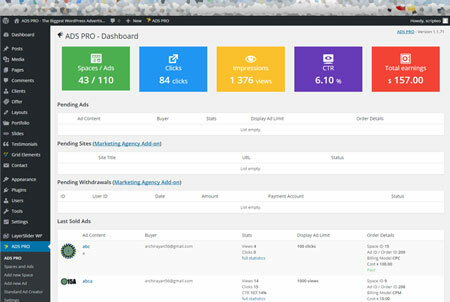 Ads Pro for WordPress can help. It comes with scheduling, geo targeting and support for mobile devices. Ads Pro gives you multiple ways to display your ads (video, floating, grids, sidebar, …). It comes with over 25 ad templates for you to try. You can target certain states, countries, or zip codes. 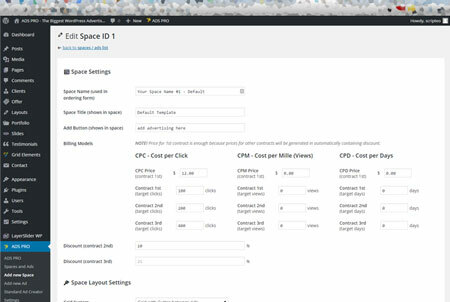 Webmasters get to choose to show or close ads after certain number of seconds or limit the number of times ads are shown per user/session. Ads Pro lets you accept payment via PayPal, Stripe, bank transfer and other popular payment methods. Customers can schedule their ads using a calendar on the order form. Webmasters can offer discounts to encourage more business. This is a commercial theme by an Elite Author.